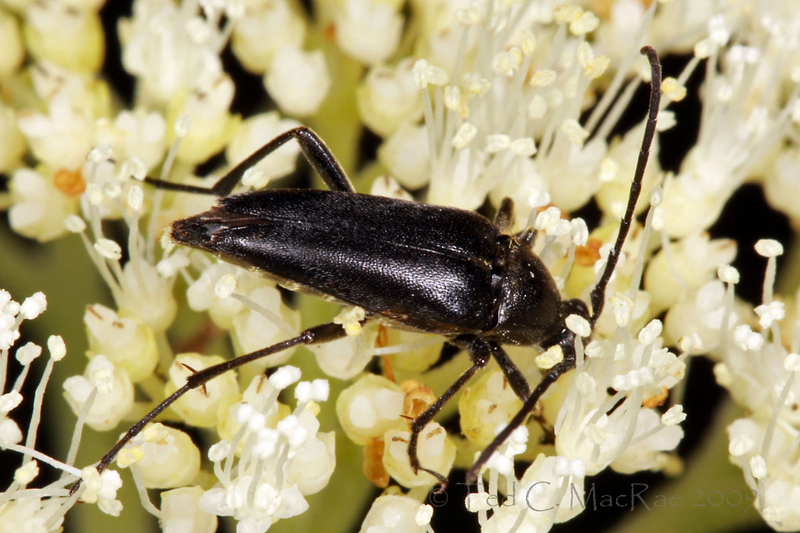 Typocerus lugubris on Hydrangea arborescens, Trail of Tears State Park, Missouri. Members of the genus Typocerus are among the more commonly encountered species of the so-called “flower longhorns” (family Cerambycidae, subfamily Lepturinae) in eastern North America. In addition to the narrow-necked, broad-shouldered appearance characteristic for the subfamily, species in this genus are recognizable by their strongly tapering elytra, strongly basally depressed prothorax, and apically produced antennal segments with distinct poriferous areas (Linsley and Chemsak 1976). Eight of the 15 species known from North America occur in Missouri, where they are commonly encountered on a variety of flowers during the months of June and July. Some of these species can be difficult to distinguish from each other – in fact, Missouri’s rarest species (Typocerus deceptus) is almost identical in appearance to one of Missouri’s commonest species (Typocerus velutinus), and several other species resemble them closely enough to require careful attention details of coloration when attempting identification. Typocerus lugubris is not one of those species, its all-black coloration making it quite distinctive within the genus. Two other species in Missouri are mostly black, but unlike T. lugubris they always bear yellow blotches in the basal area of the elytra (T. lunulatus) or exhibit yellow transverse bands (T. zebra). Typocerus confluens also is a rather uncommon species in Missouri that varies from chestnut brown to nearly all black, but it is much more robust than T. lugubris (and also bears erect hairs on the pronotum and lacks poriferous areas on antennomere 6). The remaining species tend to be chestnut colored, at least in the basal area of the elytra, with more or less distinct transverse yellow banding. Photo Details: Canon 50D (ISO 100, 1/250 sec, f/18), Canon 100mm macro lens, Canon MT-24EX flash (1/4 ratio) w/ Sto-Fen diffusers. Post-processing: levels, minimal crop, unsharp mask. I know that size rarely seems to be an issue when entomologists identify insects, even from photographs. But I am not familiar with the flower, so I have no sense of scale for this longhorn. What would be the body length of T. lugubris? Actually, size can be quite important – I admit to being neglectful of this fact more often than I should. Typocerus lugubris is in the 13-16 mm range, rather typical for many members of the genus/subfamily.